Tune/lyrics source of Bob Dylan's "With God On Our Side." Likely source: The Clancy Brothers and Tommy Makem. The DIGITAL TRADITION folksong database contains a more complete version (file name: PATGAME1) along with a parody by Susan Lohr entitled "Liam's Patriot Game." According to Jim McLean there was one song that [Nigel] Denver [Scottish folksinger] sang, Dominic Behan's "The Patriot Game", which Dylan took a particular interest in. He asked McLean about the song and within three months had adapted the tune and indeed the theme of the song. It became Dylan's most brilliant debunking of the God and Country ethos, "With God On Our Side." I explained -- probably lectured him -- about Dr Johnson, who's one of Dominic [Behan]'s favourite writers, and that's where Dominic picked up [the] saying: "Patriotism is the last refuge of a scoundrel." I explained the song to Dylan at the time. Transcribed from "In Person at Carnegie Hall" by Manfred Helfert. Additional or alternate verses (in italics) from Frederick Hetman (ed. ), Irische Lieder und Balladen, Frankfurt, 1984. My name is O'Hanlon, and I'm just gone sixteen. And so I'm a part of the patriot game. They soon made him part of the patriot game. And gave up my boyhood so happy and gay. To play my full part in the patriot game. This island of ours has for long been half free. To play my own part in the patriot game. Those rebels who sold out the patriot game. I think of those traitors who bargained and sold. 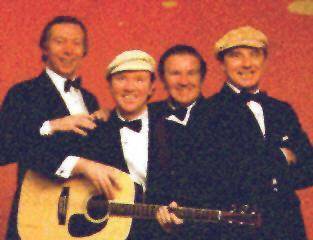 Behold Liam Clancy -- what a terrible thing! With his passion for singing "The Patriot Game." Such a talented young man has rarely been seen. Since somebody taught him "The Patriot Game." "He's going to give us 'The Patriot Game'!" One Paddy for breakfast has long been the rule. His passion for singing "The Patriot Game." It seems that he never will do it again. And the words, "Died of singing 'The Patriot Game'."